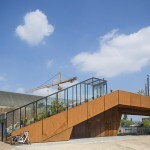 Park and bridge in one: The Paleisbrug opens! 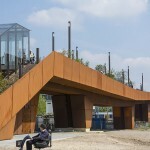 The Paleisbrug is a raised park and pedestrian and cycle bridge in one. 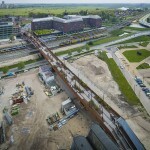 The bridge forms a 250 metre-ling link across the railway track between the historic centre of ‘s-Hertogenbosch and Paleiskwartier. Paleiskwartier is a newly developed district that houses the court building, various universities of applied sciences, homes and offices. 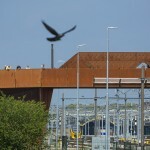 The new bridge has also been fitted with a large solar collector, which will supply the surrounding area with energy. During the Eighty Year War, ‘s-Hertogenbosch was defended by having the surrounding landscape flooded (inundated). A lot of land is still not developed, which means ‘s-Hertogenbosch still borders onto an open green area, the Gement. The Gement is unique from both a historical and scenic point of view. Nowhere in the Netherlands will you find an area of natural beauty this close to a city centre. 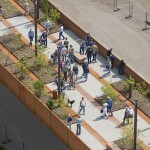 Because of the length of the bridge and the spectacular views across the Gement, a recreational area was created on the bridge. 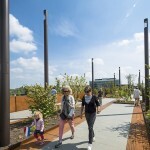 The park on the bridge is in line with the views, but also with greenery along the Dommel River and the recreational area around the Hofvijver in Paleiskwartier. 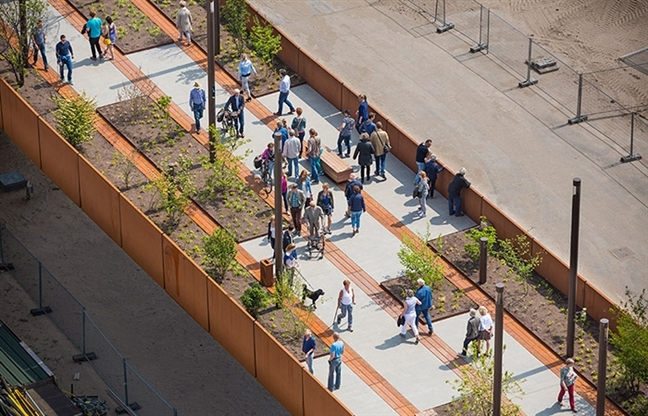 By turning the bridge into a park-like area, more than 2,500 m2 of park has been added to the centre of ‘s-Hertogenbosch. Plants, trees, paving, furniture and lighting have been integrated in folded sheets of weather-proof steel. 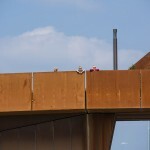 The rusty colour of this steel is characteristic for the Paleisbrug. Weather-proof steel is a steel alloy with a dense corrosion layer, bringing the corrosion process to a virtual standstill. This means the metal can be left exposed. The weatherproof steel, which corrodes about 0.5 mm per 100 years, is 1 mm thicker in all places than would initially be required: after all, steel corrodes on two sides. As such, the bridge has a lifespan of at least 100 years. 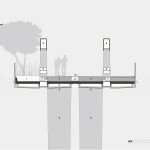 Furthermore, the robust appearance of the steel fits in well with the atmosphere created by the city’s fortifications. character. 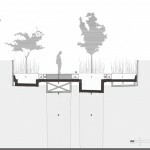 On the side of the city centre, the bridge will have low, savannah-like plants and individual trees. 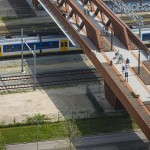 Where the bridge crosses the railway track, there will only be low plants, in line with the extensive views. 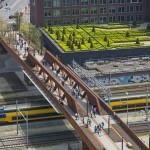 On the side of Paleiskwartier, the bridge will have more of a forest-like character. 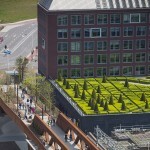 The new green creates a new eco system in the city centre, offering room for new flora and fauna. A drip feed watering system with detection has been installed in the flower beds on the bridge. The discharge from the planters is fitted with an additional overflow pipe, so that the plants will never receive too much water. In the evenings, the plants, benches and paths are lit up by LED lighting, which means the bridge is a pleasant area even after sunset. 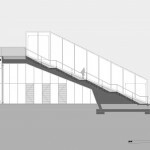 In order to be able to keep the bridge free from ice during the winter, floor heating with a low temperature was a departure point in the design. Road salt is not an option, as it would kill the plants and affect the material. 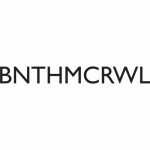 That is why Benthem Crouwel looked for a sustainable solution for the use of floor heating. 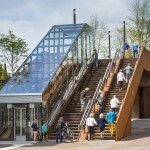 The answer is to have the Paleisbrug act as a giant solar collector during the summer. 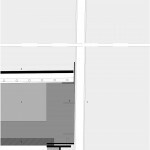 The floor heating/solar collector is connected to a heat/cold storage unit. During the summer, the bridge retrieves more heat from the bridge than is needed during the winter and supplies the surrounding district with energy. 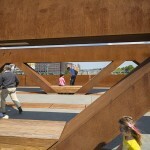 The Paleisbrug is composed of various sizes of spans that run from column to column. 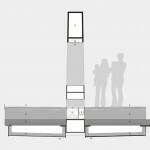 The columns are covered in weather-proof steel panels, so that they form a whole with the spans. 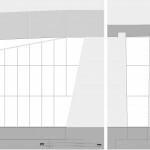 The spans comprise of horizontal weather-proof steel ducts covered a concrete compression layer. The longer the span, the higher the ducts. The largest span, measuring 60 metres in length, runs across the railway track. For this span, an additional trussed joint has been created on top of the bridge deck. A structure underneath the bridge deck was not possible in this place. 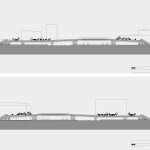 The trains need such a large amount of headroom that the entire bridge would have had to be raised by a couple of metres. The concrete compression layer is perforated in areas with trees. This has created a tree bed in the steel box girders. 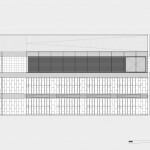 The perforations are placed strategically and lead to a good result, both for the planting scheme and the structure. The concrete is not visible anywhere on the bridge. 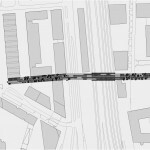 Four lanes, each two metres wide and alternately consisting of flower beds and paving, run across the length of the bridge. Strips, sixty centimetres wide and finished with a weatherproof steel studded sheet, run between the flower beds and paving. This where the cables, pipes and gutters for the rain water discharge from the street can be found. 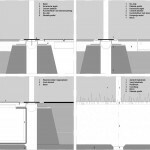 The setup of the bridge deck and pipework can be replaced, if necessary, without affective the main supporting structure.